For the past 7 years I’ve been riding to work on a typical ‘winter trainer’ DF road bike consisting of a generic aluminium frame, solid 32 spoke wheels shod with Michelin Krylions and mudguards, and typical roadie gearing: 53/39 chainset and 9 speed 13-26 cassette. This bike was ok for my 14 mile rural round trip to the office but like lots of cyclists I would give it a miss at the first sign of ice on the roads. I had come across velomobiles and recumbent trikes on the web and thought they looked like the ideal machine to extend my riding right through winter. I wasn’t quite prepared for the investment in a velomobile but a trike might a good, more affordable introduction. 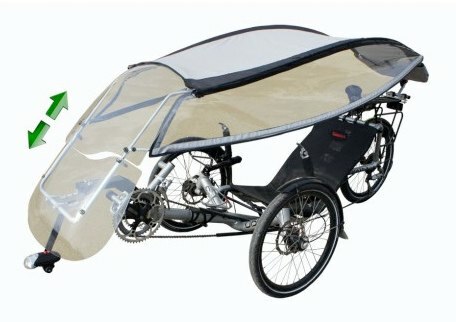 This seemed to me to be the ideal setup for a practical everyday human powered vehicle.While waiting on the trike to be built I spent some time researching fairings and came across the Veltop which I ordered direct – this came from France and I had it a few days after I got the trike home. A couple of hours of fixing it to the trike and I had myself a highly practical weather resistant pedal power vehicle. Ideal. The contrast between the bike I was using and the trike was huge: I was going from a machine weighing approximately 10kg running little 23mm tyres to a beast weighing more like 20kg (possibly more with Veltop attached). I was expecting to be really slow on the trike but it wasn’t really that bad though my legs were well aware that they were doing something a little different to what they were used to. Veltop in complete form with side sections which are zipped to the roof and have poles running through a sleeve at the bottom. I’m now 8 weeks and 820 miles in and my legs are feeling a good bit stronger in recumbent mode. To work is generally uphill and slightly under 7 miles. Home is generally downhill and slightly over 7 miles. Obviously there are lots of factors that affect how long it takes us to cycle somewhere including wind speed and direction, temperature, choice of tyres, and most importantly how we’re feeling at the time, but the times above are my most common range of times for getting to and from work. I don’t think the difference between the DF road bike (which is at the racey end of the road bike spectrum) and the trike is all that staggering considering the big difference in size and weight of these vehicles. Ignoring speed, the trike is better for me in every other respect: it is more comfortable (more on this below) and safer because motorists leave much more space when passing. This mirrors comments from other recumbent riders, particularly trike riders. It’s easier to carry luggage – the side pods take a load of gear and sit nicely out the way behind the seat. If you wanted to take a mountain of gear then you could easily throw some panniers onto the rack too. The trike would make a great touring machine and it’s something I quite fancy doing in the future though whether my family allow me the time away or not is another matter! Made it to the top! In one ride I’ve been in Perthshire, Angus and Aberdeenshire. The comfort aspect is amazing – you just sit on a nice mesh seat and pedal – no strain on wrists, arms, shoulders, neck or back. 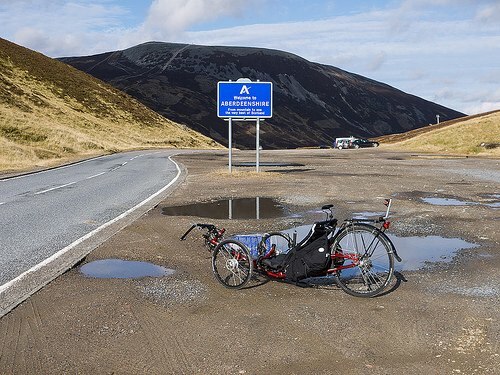 My longest ride to date has been 105 miles, the route being from Perth up Glen Isla then up to the ski centre at Glenshee, back down to Blairgowrie, across to Dunkeld then back down to Perth – 9 hours in total and apart from feeling a little tired afterwards I felt surprisingly fresh. There’s no way I’d have felt as good after 105 miles on an upright bike! The only downside to the trike is storing it. I have a garden shed that is large enough to house the trike but the door on it is frustratingly narrow, so getting the trike in and out is not as easy as it could be. I’m finding that the best thing to do is to wheel the trike into our dining room via the patio doors during the week when it is being used most, then keep it in the shed at weekends. I said that the trike was comfortable, and it is, but… I have a small lump on my back that doctors have advised is probably a lipoma, a benign lump of fatty tissues. Unfortunately riding the trike caused it to become infected so I had to avoid putting any pressure on my back so I’m back riding upright for the moment. The infection is now going away but I need to stay off the trike until I get the lump removed and I’ve no idea when that will be. I never gave the little lump on my back that I’ve had for years any thought when considering recumbents but hopefully this is just a short term problem. Excellent choice of trike (not least the striking colour… thumbs up!) and good luck with the back issue! 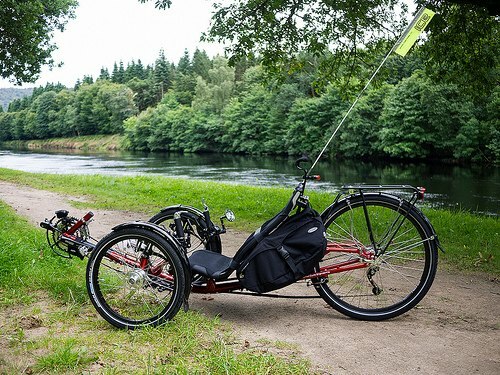 The Veltop consists of a two part windscreen that connects via a bracket attached to the boom or derailleur post depending upon your model of trike (to the boom in the case of the ICE Sprint), a bracket that attaches to the rear rack, and a pack that contains poles (fibreglass just like tent poles) and the canopy and sides. There’s an optional extra front light extension bracket (that I purchased) that allows a headlight to be mounted outboard of the windscreen, thereby avoiding any unwanted glare or reflection. I haven’t weighed it myself but according to Veltop the whole lot weighs about 3.9kg. The lightweight crew will recoil in horror at that but in my experience it makes very little difference in performance to a trike that is already heavy and it’s well worth it for the comfort that it affords. The windscreen should be fitted so that it sits at a roughly 45 degree angle and the canopy pack clicks onto the rear rack bracket, then you take out the poles and connect them between the canopy pack and the windscreen. Then the canopy pulls out and slides along the poles and velcros to the top of the windscreen and to the canopy pack. More poles come out and are threaded through a sleeve in the canopy sides which are then zipped to the main canopy and again velcro’d to the windscreen. The canopy should be fitted so that there’s a roughly 2 inch gap between the riders head and the canopy. I spent about 2 hours fitting the whole thing to the trike and then probably several hours over the next few weeks tweaking it to get it just right. The windscreen is in two parts, the bottom section fixed and the top section can slide upwards to allow a gap of up to 10cm for airflow. Interestingly, I have found that the performance of the trike is least affected with the Veltop in either of the two states that I use it i.e. windscreen off completely or the whole thing completely assembled. 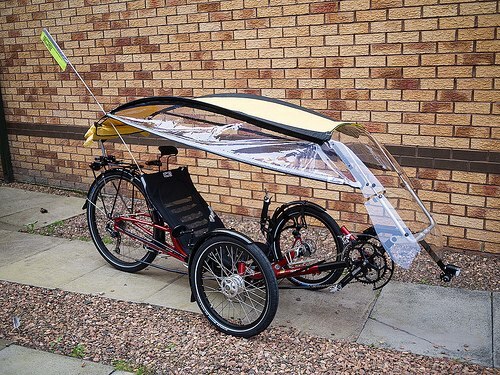 I don’t have numbers to back any of it up, but it definitely feels as though the aerodynamics suffer when the windscreen is used without the canopy, but using the whole thing fully assembled doesn’t have any noticeable negative affect on speed compared to running the trike naked. Regardless though, it has been totally worth it, not having the rain driving into your face or collecting on your lap is a good thing and you just have a little wheel splash to deal with. It’s the closest I’ll get to a velomobile for the next few years! Like you, Alan, I’ve just completed the purchase of a Sprint 26. In my case I bought a frame and wheels via David at Laidback and used stuff I already had. I’m very pleased with it – a big improvement on the Q26 I had a few years ago.You are right about them making great tourers. I used the Q on a 1000 mile trip across France in 2010. Probably the best tourer I had owned up to then. Now the frosty mornings are here its great being able to continue to ride right through them.